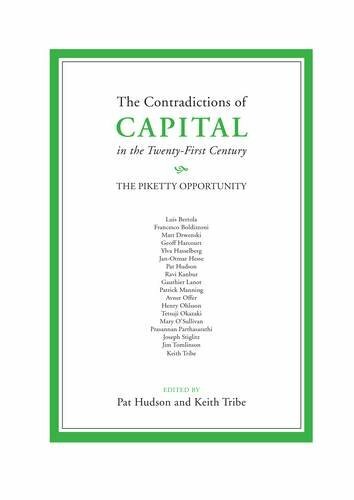 I also recently received another collection, The Contradictions of Capital in the 21st Century: The Piketty Opportunity, edited by Pat Hudson and Keith Tribe. It includes essays by Ravi Kanbur, Joseph Stiglitz, Avner Offer, among others. I haven’t yet read this one, although its take is more clearly historical and global, whereas After Piketty‘s is more inter-disciplinary. For all the influence economics is supposed to have on policy and the character of our societies, not many economics professors make any impression on public consciousness. Fewer still attain Thomas Piketty’s rock star status (well, minor rock star at any rate) following the publication in English of his Capital in the 21st Century[i] in 2014. Piketty captured and gave authoritative confirmation of something many people believed to be the case, given their own experience and observation: that inequality in western economies had increased to a great degree. Many economists see Piketty’s dedicated effort – with colleagues Emmanuel Saez and the late Tony Atkinson – to put together the data on income and wealth over a long period of time as the main merit of his work. While there is some debate about the figures, this effort is a titanic contribution to knowledge, making possible further study of the trends and causes of inequality. 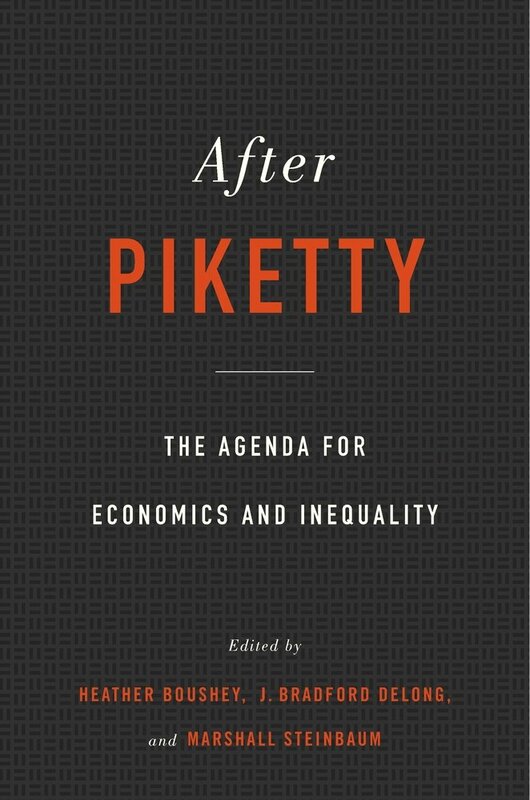 The essays in After Piketty have a different focus, however: an assessment of Piketty’s arguments about the dynamics of capitalist economies that generate the observed patterns of income and wealth inequality. Some of these perspectives concern the economics, others the links between economic and social or political forces. Piketty’s empirical observation is that inequality in the western economies declined through the entire middle part of the 20th century, but from around 1980 it had started to increase again, to return to the levels of the Gilded Age. His theoretical argument is that there is an inherent dynamic in the process of economic growth tending to increase inequality, a dynamic halted and reversed in the 20th century by the two cataclysmic world wars, by the post-war welfare state and social market economies (especially in Europe) and by rapid post-war growth. The key point he makes is that when the growth rate slows, the rate of return on capital falls more slowly, increasing the ratio of capital to income and further widening the gap. This is the r>g formula fashionably adorning some t-shirts for a while. For economists, there is nothing inexorable about this. As Paul Krugman points out in his essay in After Piketty, the theoretical argument depends (among other things) on it being easy enough to substitute machines for workers, and there is no definitive empirical evidence this is so. Devesh Raval points out a number of other problems. Among them, Piketty uses the term ‘capital’ as an abstraction, but the empirical claim that r>g elides physical capital used in production, housing capital, and the human capital resulting in high earnings for some people. Indeed, the share of top incomes coming from earnings (rather than rents and dividends) is a great contrast with the inequality of the early 20th century. 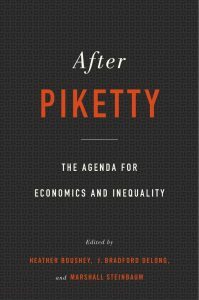 Suresh Naidu underlines this point, calling Piketty’s argument “institution and politics free”: “When wealth is understood as police-backed paper claims over resources, rather than the resources themselves, the undemocratic nature of wealth inequality becomes much clearer.” A number of other essays in the volume round out the economists’ (sympathetic) critique of Piketty’s book. The two subsequent sections cover extensions of Piketty. His collaborator Emmanuel Saez argues for continuing and extending the data collection effort. This is a significant point: phenomena for which the data are not readily available are invisible in political and policy discourse. 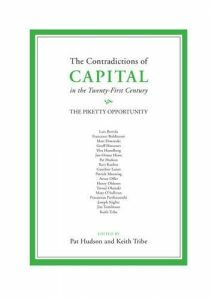 In many ways Capital in the 21st Century was published much too late. The political consequences of great inequality were already playing out in the anger and division so visible now in politics in the United States and across Europe. Saez makes the point that although there has been significant data collection since the 1960s and 70s on individual incomes, largely through surveys, this statistical approach severs the connection between income distribution and macroeconomic outcomes. Economists in the late 20th century thinking about the economy in the aggregate largely stopped noticing the macro-level inequality trends. There is little reliable data on wealth (as opposed to incomes) at all, and research into wealth distribution and its evolution is correspondingly sparse (as Mariacristina de Nardi and her co-authors point out in their essay). Filling some of the other research and policy gaps will be crucial for anyone who considers the extent of modern inequality to be problematic. One made visible by the British EU referendum and the US Presidential election is the spatial dimension. Economies have a geography, something economists have until recently been prone to overlook; financial capital is highly mobile geographically and – as Gareth Jones points out here, has also created ‘extra legal’ zones in tax havens where it can safely land. (In a fascinating book, Capital Without BordersHeather Boushey explores in After Piketty the implications for women’s economic and political autonomy of ‘patrimonial capitalism’, particularly given the gender bias of inheritance. The book ends with some reflections from Piketty himself. He is disarmingly open to critiques of his work: “I would like to see Capital in the 21st Century as a work-in-progress of social science rather than a treatise about history or economics,” he writes. As he argues here, all the social science disciplines are needed for a complete picture. However, the critiques matter, at least to the extent that one thinks the current degree of inequality is unsustainable. Two other recent books point to contrasting possible futures. In his The Great Leveler[iii], Walter Scheidel paints a picture not unlike Piketty’s of an inexorable internal dynamic whereby societies become progressively more unequal, until this provokes a reset through war or revolution. In complete contrast, Tony Atkinson’s Inequality[iv], published the year before his death, presents a wholly pragmatic 15-point list of policy measures to limit and reduce inequality. Taking these together, it is hard to avoid the conclusion that if you do not adopt the Atkinson approach you get the Scheidel outcome. This was exactly the realization that led to the creation of the post-war social contract in the late 1940s. The editors’ introduction in After Piketty zeros in on this contradiction at the heart of Piketty’s work and its reception: are there fundamental, intractable laws of capitalist dynamics, making garden-variety policy analysis of inequality ultimately futile? Or rather are there, “historically contingent and institutionally prescribed processes that shape growth and distribution?” Capital in the 21st Century does not resolve this; neither do the essays in After Piketty. Perhaps it is a purely academic question, but to the extent that any of us troubled by the new Gilded Age, we have to act as if the second is true regardless. Diane Coyle is Professor of Economics at the University of Manchester & Co-Director of Policy@Manchester. [i] Thomas Piketty, Capital in the 21st Century, Belknap Press, Harvard, Cambridge MA, 2014. [ii] Brooke Harrington, Capital Without Borders: Wealth Managers and the One Percent, Harvard University Press, Cambridge MA, 2016. [iii] Walter Scheidel, The Great Leveler: Violence and the History of Inequality from the Stone Age to the Twenty-First Century, Princeton University Press, Princeton NJ, 2017. [iv] Anthony Atkinson, Inequality: What Can Be Done?, Harvard University Press, Cambridge MA, 2015. This entry was posted in Main Page and tagged inequality, review by Diane Coyle. Bookmark the permalink.